High and low cuisine mix at a Masbia soup kitchen fundraiser on the Upper West Side. Alex Rapaport is the Soup Kitchen Tzaddik. The soft-spoken yet scrappy entrepreneur has built the Masbia soup kitchen into something of a righteous empire. 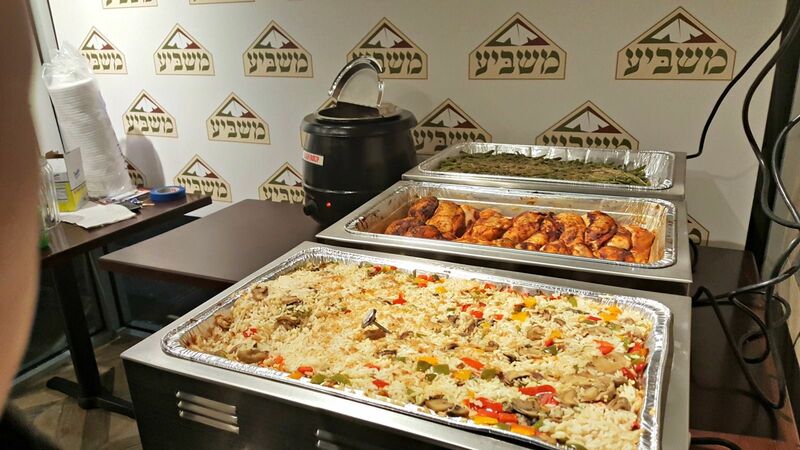 He opened his third location earlier in the year, this one in Borough Park, and his staff serves two million meals a year to New York’s needy, Jews and non-Jews. “We’re a restaurant without a cash register,” Rapaport memorably put it. They serve up dignity, and they fill bellies, masbia being Hebrew for “satiate.” Word got out a couple of years ago; even People magazine stopped by. Masbia’s co-founder and executive director has a glimmer in his eye, and he’s got something of the showman in him, too, albeit a humble one. So when it came to his latest fundraiser last Wednesday evening in the basement banquet hall of Lincoln Square Synagogue — a Top Chef-style kosher cook-off with the clever title of “Chop Hunger” — Rapaport had a little something up his sleeve. The set-up was refreshingly down-scale, culinarily speaking: Chef Bryan Gyrka (Milt’s BBQ for the Perplexed in Chicago), Chef Asaf Hadad (Fuego in Miami) and the pitmaster Mendel “RaBBi-Q” Segal from Kansas City, one of America’s barbecue capitals, would fashion a meal out of the humble foodstuffs found in a soup kitchen cupboard. There were white potatoes, carrots, canned green beans, an assortment of other greens and an orange. (All the food, and the hall, was donated.) And two secret ingredients that revealed Rapaport’s savvy and sense of humor: the deliciously mismatched quail and oatmeal. For 36 symbolic minutes, the audience of about 200 and the celebrity judges (Mike’s Bistro’s Mike Gershkovich, private chef Jordana Hirschel of The Blue Ladle and Adam Harvey of “Top Chef”) were treated to the chefs’ on-the-fly decision making; their choices were communicated in drive-by interviews with emcee Avi Levy (Avi’s Kosher Kitchen) as he moved from cooking station to station. Wonderful aromas soon rose into the air. Was that a touch of ginger? A scent of citrus? And was that romaine lettuce really being charred? The chefs’ creativity was on display even before the competition began. People moved from a station featuring Hadad’s pulled beef barbecue on a ciabatta roll to Hirschel’s exotic tomato bar to Gyrka’s beef burger sliders. As Miles Davis’ classic tune “All Blues” played in the hall, I headed for Abeles & Heymann’s jambalaya and then made a stop at the A&B Famous gefilte fish table; the night was hip, and it was heimische. As the clock wound down and the plating was completed, Hadad stood next to his hot potato salad with quail and citrus, and “oatmeal dust”; Segal looked over his seared quail with thyme, oatmeal croquettes and garlic mashed potatoes; and Gyrka hovered near his veggie hash with seared citrus quail and grilled romaine. Hadad was the judges’ top pick, but Rapaport was the real winner (he was aiming for a haul of $50,000). Or rather the Masbia ethic — the blessing of a square meal — was the winner. At the end of the night, Rapaport and his head chef, Ruben Diaz — both heroes in their own way — stood together, removed from the action at the side of the stage, in a rare moment of rest. Tomorrow there would be 500 meals to knock out.